Discussion in 'Do-It-Yourself & Gear Modifications' started by fast14riot, Aug 30, 2011. 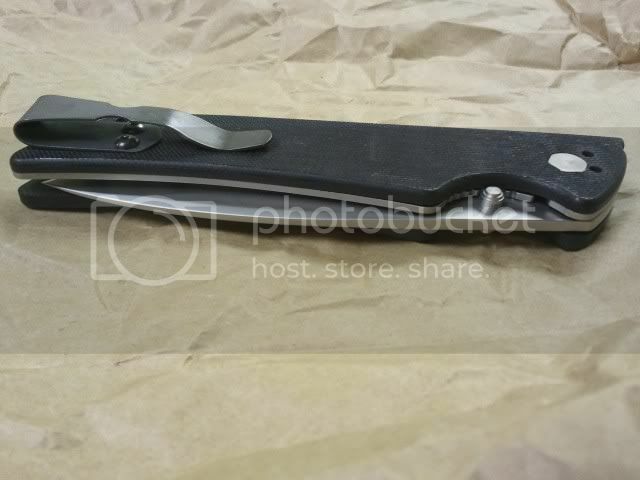 Alright fellow modders and tinkerers, here is mod #3 to my Kershaw Skyline. This time it isn't specific to the Skyline, but can be done for any knife! 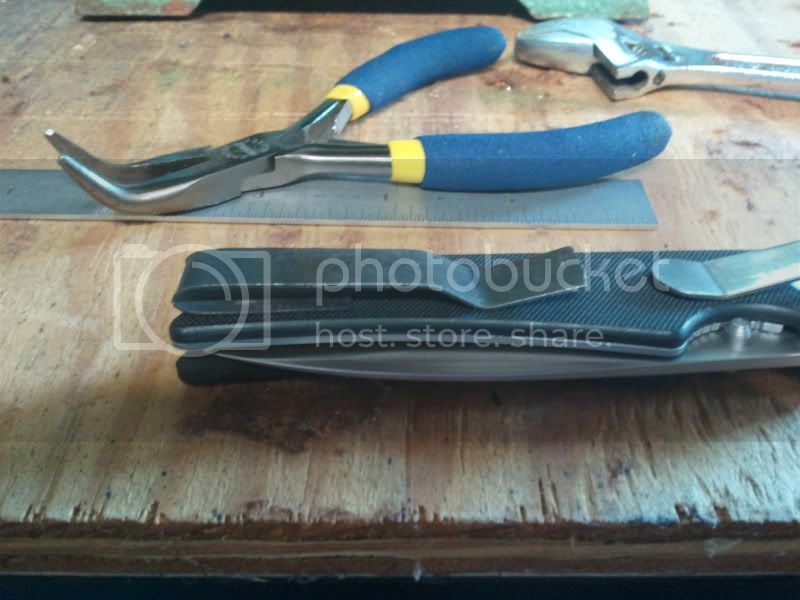 A home grown "low rider" pocket clip from scratch! The issue with the Skyline is the great difference in ride height between tip-up and tip-down carry. 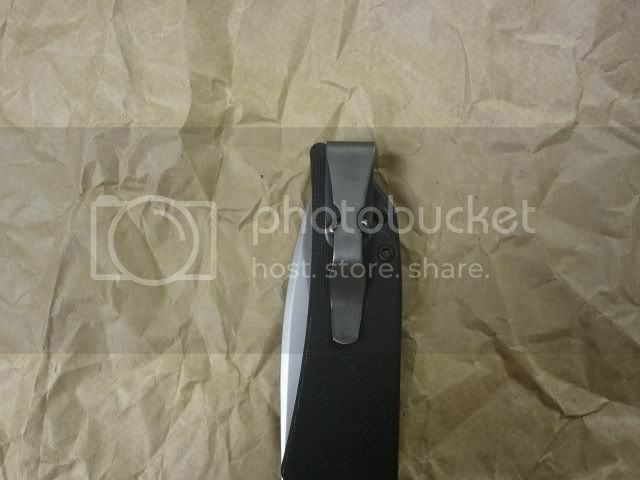 The first pocket clip mod I did with the factory clip makes tip-down totally concealled, and is a vast improvment on tip-up but some of the knife is still visible. Sometimes this just will not do. Especially in an office environment or when dressed up. I don't normally carry tip-up, but after getting some feed back asking about tip-up, I decided to figure out a way to do this in the garage-mod fashion. No fancy materials, no expensive equipment, and no buying pre-made parts! We are trying to make it ourselves! Now on to todays project. Some of you may have seen the prototype I posted up the other day with some "critical errors." That one was taken all the way to finishing just to actually be a prototype once the mistakes were noticed. I will be using pics from the making of the protoype along with some pics of the second clip during this essay. The following pic is what my modded factory clip looks like in tip-up orientation. This is better, but not perfect. First off I started on a search for suitable material to create a decent clip from. It needs to be the right thickness (.025" - .035" for this size knife), easy to work and drill, be able to bend when we want it to and not bend when we don't, and take a decent finish. Trying to find all these properties in a commonly available material you may have in your garage was difficult, but I think I found a perfect solution. 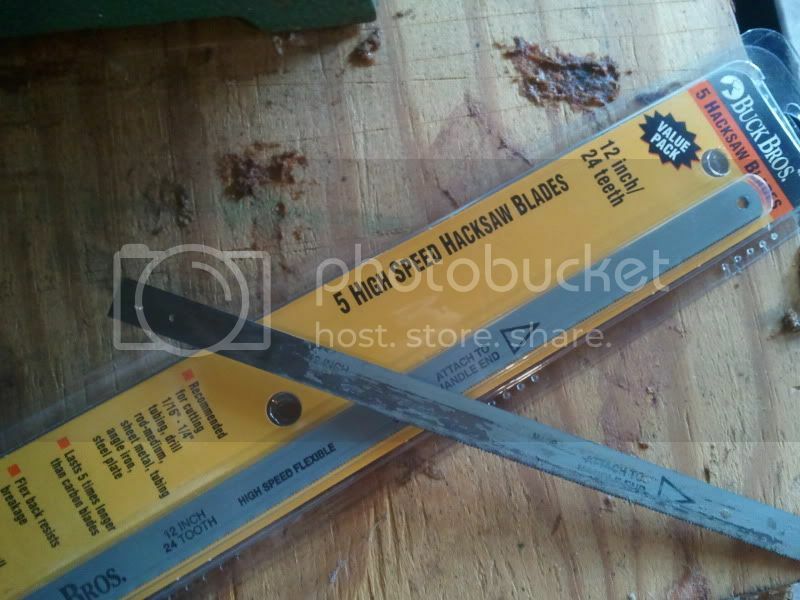 High Speed Steel hacksaw blades! Yep, good ol' spring tempered (not bi-metal) cheap hacksaw blades. HSS that has been spring tempered usually has a soft back so it is relativey easy to work with normal tools. This pack of blades I think cost me less than $10 but that was a while ago. They are also made in the U.S.A.! I had a couple of worn out ones laying around from finding out what they can't cut, so I didn't have to buy any. In fact, if you have everything else there is only one thing you should have to buy, a #44 drill bit. This is the exact size of the holes in the factory clip and scales, 5/64" will not do for this. It is .089", I believe, and the major thread diameter of the screws is .085" which makes for a nice easy fit without much play. Don't worry, these things are cheap. I paid $1.60 each at my local hardware store (no it's not an average hardware store) and do be sure you buy a few, they do break easy. Ask me how I know, and I'll hand you a pile of broken bits. Not from this project, but it does happen. Now we need to prepare the blade for it's new found purpose. We need to grind off the teeth far enough back so the waviness is gone. I don't know the term for it, but you know what I am talking about. I did this with the bench grinder, just running the blade left and right while holding it bare handed. This is important because you want to make sure you don't get the steel too hot or it will harden on us and be impossible to drill (critical mistake #1 on the prototype). I do keep a small cup of water just for cooling it down. If it is to hot to hold, chances are it will be hardened in that localized zone. Do try to keep your grind line as straight and parallel as you can, it will make clean up easier. To trim it to a more managable length just clamp it in your vise and bend it back and forth a couple times, it will snap cleanly off. Speaking of length, we need to figure out how much we are going to need for compleate pocket immursion and enough spring tension. The spring tension part is knda subjective but I found that about 1.5" or so felt right. But 1.5" to where? From tip to bend. Ok, got one dimension figured out. Now how much on the backing piece? On the skyline, 3/4" from the center of the holes to end of the scales, plus a little extra, call it an even 1". I broke mine off at about 3" to allow room for error. Now to even up the edge, take your piece on edge and drag it along a file. Don't clamp it in a vise and try to file it, you will bend it and make more work for yourself. You will quickly see where the low spots are, and find any high spots from grinding the teeth off. You only need to file this one side. Got it nice and straight, now we need to drill the holes. Sorry I forgot to take pics at this step, but I clamped my piece to my scale (removed from the knife of course) lined up how I wanted it and used the holes in the scale as a guide. Chuck your #44 bit in a dremel and keep the rpm low, insert the bit through the hole to the piece and then turn on your dremel. Be conscious of the bit walking and chewing up the hole in the scale. Don't let it get too hot either, remember why? Yep, it will harden and ruin your bit. Good pressure, low rpm (for a dremel), and clear your bit often. Soon enough it will break through and maybe break your bit. I don't have in my notes what the spacing of the holes are on the Skyline, but you can figure it out. Take a measurement from outside to outside and subtract one hole diameter, .089", and this gives you center to center. Competitive shooters should be familiar with how to measure this. Well now we have a couple of holes in the end of a pretty flimsy piece of steel. Time for the fun to begin! 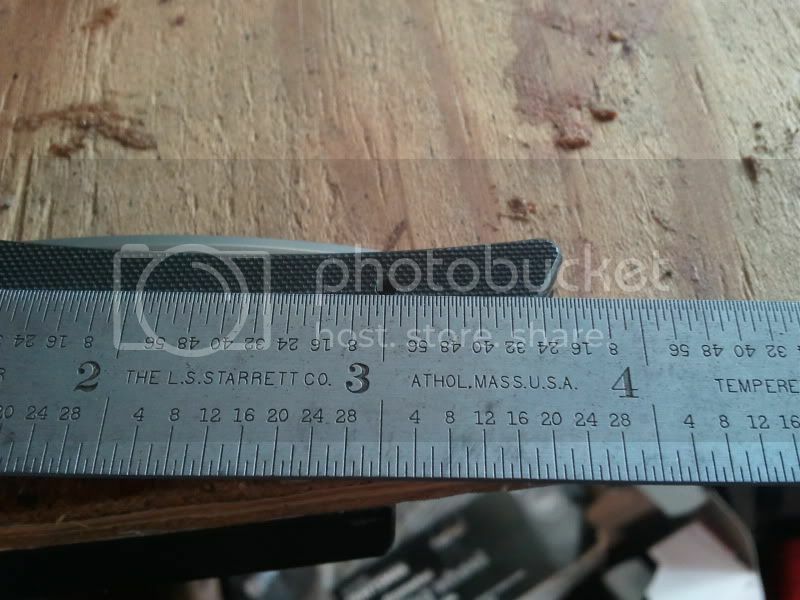 So we need the major bend to be 3/4" above the center of the holes, measure and mark this. Take an old round shank screwdriver or any 3/16" rod and lay it on the mark, start your bend cold and take it to about 45*. 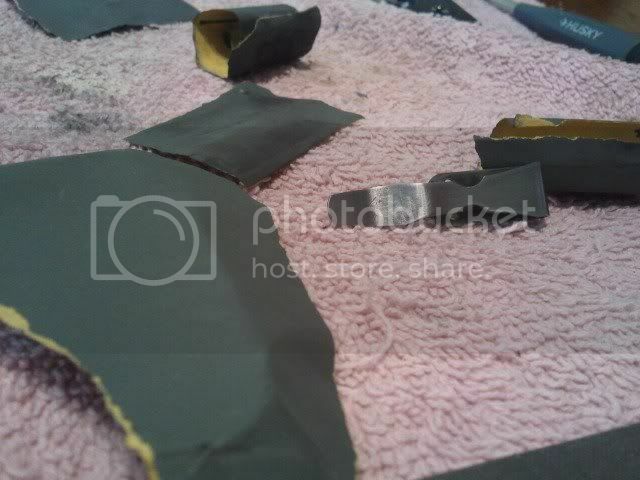 Any further risks damage from stretching, work hardening, and tearing (critical error #2 on prototype). Clamp the long side in the bench vise, plan your moves, check the path of the flame for anything that might catch fire, and then fire up your propane torch. Heat the area of the bend to a cherry red, grab the end with pliers and bend it over while still applying heat. Let go a few times and watch for spring back, over bend as needed to get a nice parallel "U" shape. Be sure to check it from the front for twisting, heat and adjust as needed. Remove it from the vise with pliers, it doesn't have to be red to be hot! Douse it in water to make sure it is cool enough to handle. Time for the ramp bends. Measure an appropriate distance from the top bend, 1.5" or so for the Skyline, and mark it. Eyeball it for what looks right, but much longer is going to be a weak clip. Now these bends can be made cold but should be backed by some sort of straight edge. A 45* angle is about all you need on the second bend, and the ramp bend is up to you. The ramp bend should be placed far enough from the second bend to allow good pressure without bowing the face or back. It should rest about like this. 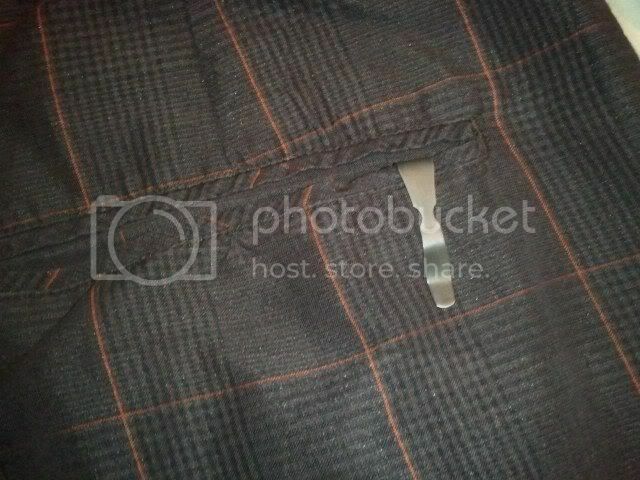 Once the bends are close, dress the sides down flat with a file, just like before. You'll feel the hard spots easily, and this ensures a nice even clip for that professional look. Trim the ramp end to an appropriate length and shape it how you like. A nice round end is what I did, be sure to take the sharp corners off so it doesn't slice your pocket. I did this in two places, on the major span and on the ramp bends for a swell center look. Now it's starting to look nicer! Be sure to pay attention to the ends of the radii so they are even on both sides. Great! We have style and function now. Don't be tempted to take the radiused grind on the major span all the way in to clear the screw heads, this will not leave enough metal for proper strength. We are going to make some cut outs to clear the screw heads, just like on the previous clip mod. 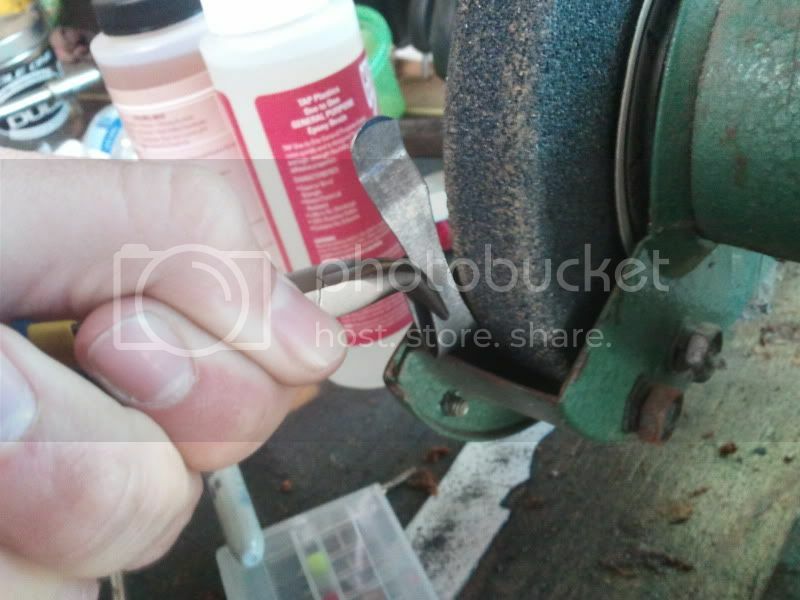 Use a 1/4" or whatever diameter grinding wheel you want and grind the clip away directly over the screw holes. Go slowly as we don't want it to get too hot. Check for ease of access often and go as far as you feel comfortable. I chose not to go so far as to allow a "drop in" fit for the screws to leave a little more meat in the middle for strength and for style. I also did not put my cut outs directly above the screws for style, but you are free to make it as difficult to get the screws in as you like. Be sure to test fit on the knife and double check all bends for alignment. Adjust and take it back off your knife. 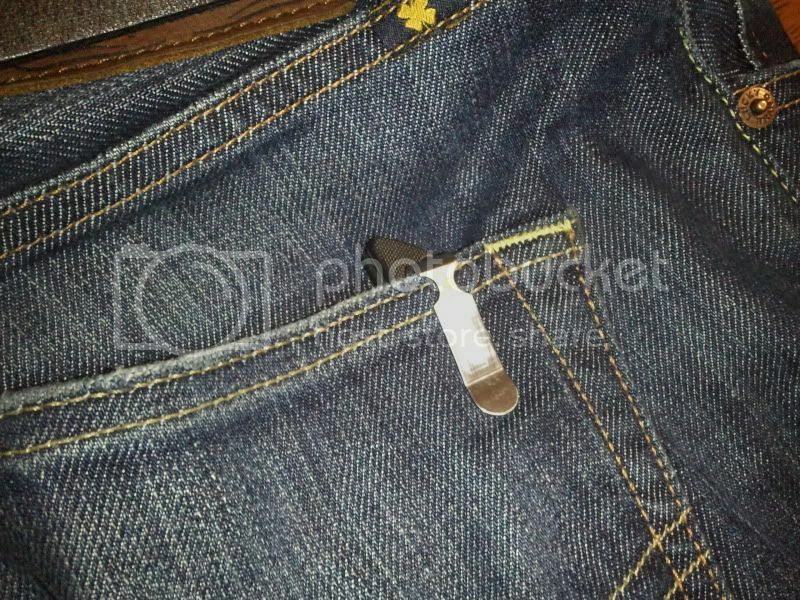 I know you have now tried it in and out of your pocket several times now and may be dissapointed at the lack of shape retention leaving you wondering if the blades you used were not the right kind. Well if they say high speed steel, they are just fine. What we need to do now is heat treat the steel to make it harder and more bend resistant. Clean up any sharp edges and burrs, sand out any scratches now. It will be difficult after HT. The better it looks before the easier it will be to clean up after. For the heat treat, no need to send it off to knife maker or build a special little forge. Just use your propane torch, some long handled pliers, and a small dish of room temp water. Grab the clip by the ramp tip holding as little as possible, put it to the flame moving it around to try and heat it as even as you can. The flat against the knife isn't as important, but from the 180* bend to the ramp bends is the critical part. Get it to a nice bright cherry red, almost orange kinda like those sunsets your wife or girlfriend loves, and keep it there for at least 1 minute. This is known as soak time, or time at temp. Once the minute is up take it as quickly as possible to the water dish and dunk it in fully while swishing it around. Watch out for splattering, boiling water. Drop it after the hissing stops and leave it for 30 seconds. It should be cool to the touch, but all black and ugly. Check for weak spots with light pressure, if it bends easily it didn't harden. The key areas are between the cut outs for the screw heads on the major span, also the 180* bend at the top. If it doesn't take a set from light flexing, you did it right! If it does, just heat it again 'til you get it right. I found that no tempering was required because it won't be abused that much, its just a clip. Well now time for clean up! Head back into the house, grab a beer, sandpaper, small needle files and an old towel to keep the mess to a minimum. Start with about 800 grit or one down from where you left off before HT. Sand off all the forge scale, it will load up the paper quickly so do use a fresh spot on the paper every few strokes. You will notice that this outer layer of scale sands very easy and once it is off you will find the hard steel. This is what it looks like once you get the scale off. Now time for wet sanding. Use windex or a drop of dish soap per cup of water. 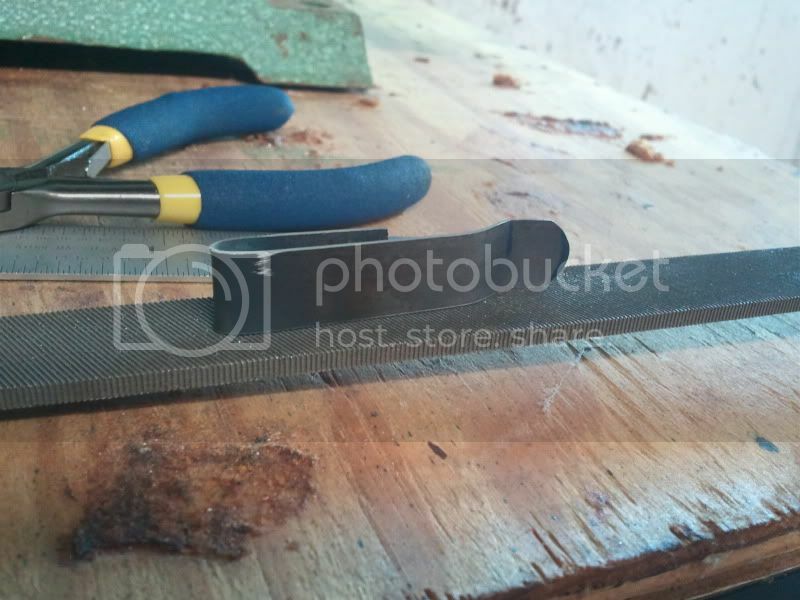 Use the needle files as sanding blocks to get inside the bends and all the tight areas. 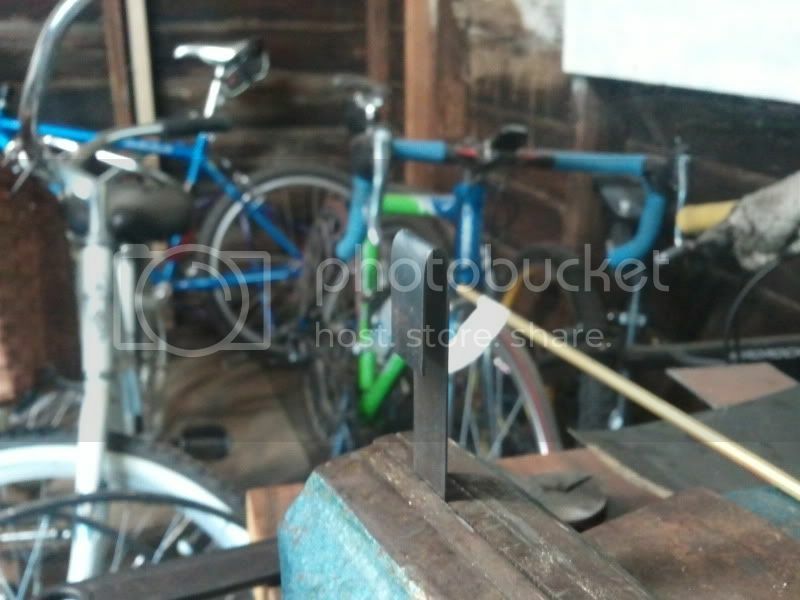 Continue sanding up to as fine of a finish as you want. When you get to 1500 or so start sanding with the length of the clip only, this will look more professional. When you get to the final grit finish you want, sand in one direction only the full length of the clip including over the top of the bend. Final finish is up to you and will take the most time and effort to make it look good. Only took an hour in the garage, but about 3 doing the finish work. The final finish is up to you, leave it at 1000 grit bare metal with some oil to prevent rusting, forced patina of your choice, or natural patina. You could also polish it with a dremel. I went a different route. I did 1200 grit then I blued it. I used Birchwood Casey perma blue and followed the directions, except I chose to buff it with 0000 steel wool after the last application for a dark grey look. Here is how mine came out. I am pleased with how this clip turned out. Making the prototype sure made the second version go much quicker. I keep saying prototype like I meant for it to be one, but truth is I just made some mistakes and decided to keep going untill I couldn't anymore. I wrote this spcifically for the Skyline but you could apply these methods to any knife needing a custom clip. Be sure to use good judgment and all proper safety precautions when modding your knife. Don't blame me if you burn your house down or hurt yourself. Do be sure to try modding your knife yourself sometime, no need to send it off for custom professional work, just try it first! You might be surprised! All the mods I have done so far have cost me a total of ~$4.00! That was for two #44 drill bits. If you don't have some of the materials needed none of them are anywhere near expensive. I love to tinker with things and this knife has lent itself nicely to being modded. This is a good way to get a semi-custom knife without breaking the bank, as well. I do these in the true DIY fashion, and will continue to do so. Please, if you have an idea for a mod let me know or do it yourself and show us how. Hope you enjoyed following along. Sonorum, rcfriskyninja, Quantum and 2 others like this. Wow! You really did a nice job on that. 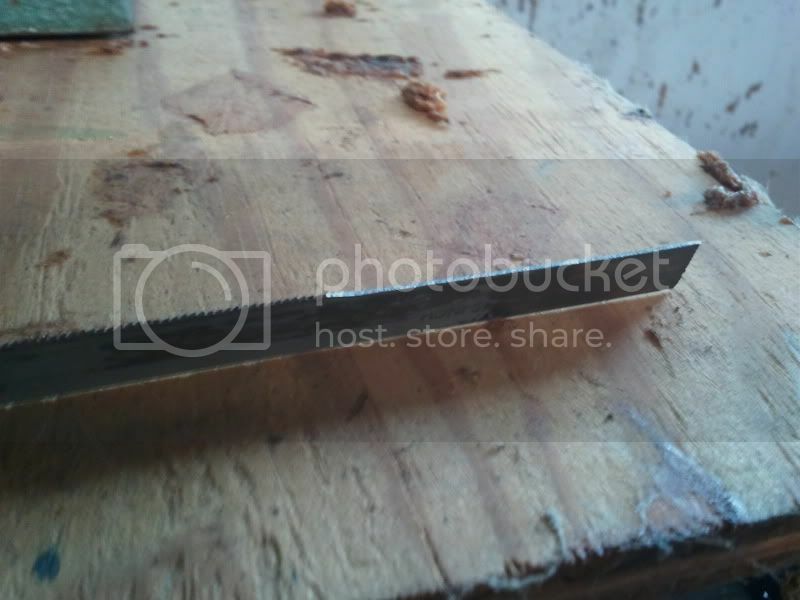 I think you hold the current record for best item made from an old hacksaw blade. Nice use for an old hacksaw blade. I can't remember how many that I have thrown away. Great post ! Thanks . Wow, nice work. I really like how it turned out. 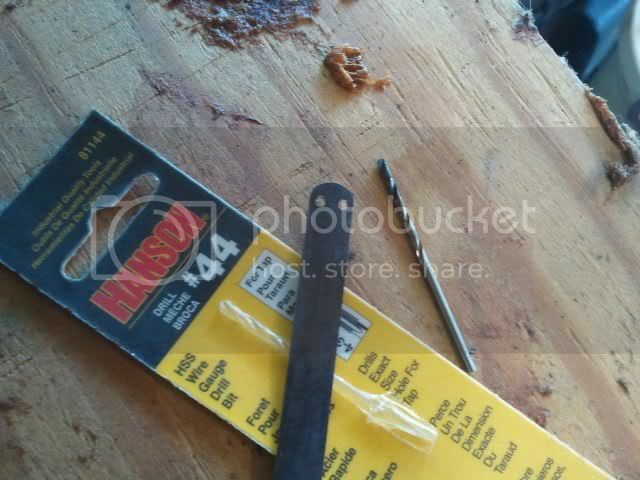 Nice Clip seem's like hacksaw blade's work great. 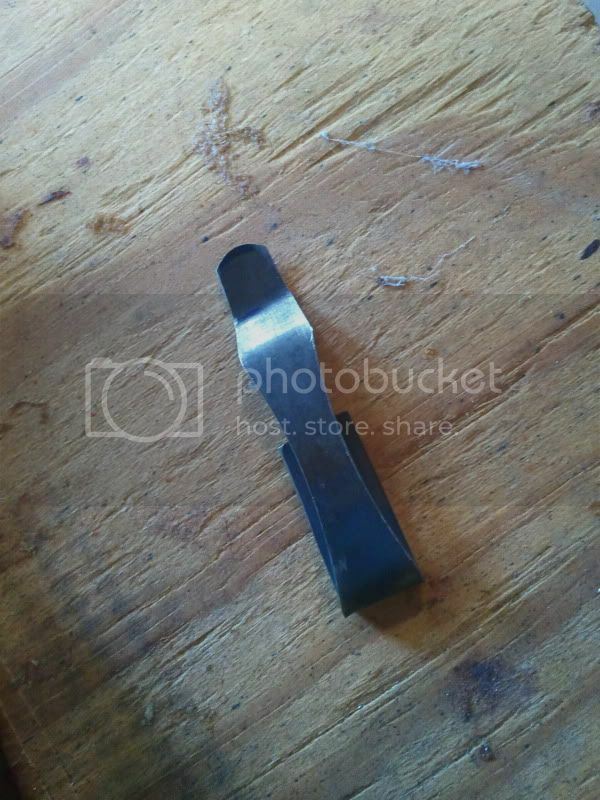 I have been wondering if about a cheap steel I can use for clip's etc. Great job. You have me wondering which of my knives to try this on first. One tip that I picked up from my dad: Another way to get a center-to-center measurement is to measure from the inside of one hole to the outside of the other. I would like to find a little bit thicker steel as this one does feel a bit light, but after edc'ing this knife and clip for over three months now it seems to be holding up just fine! I bet sawsall blades would work, as long as they're not bi-metal. I highly recommend trying it! So much fun personalizing your knives! 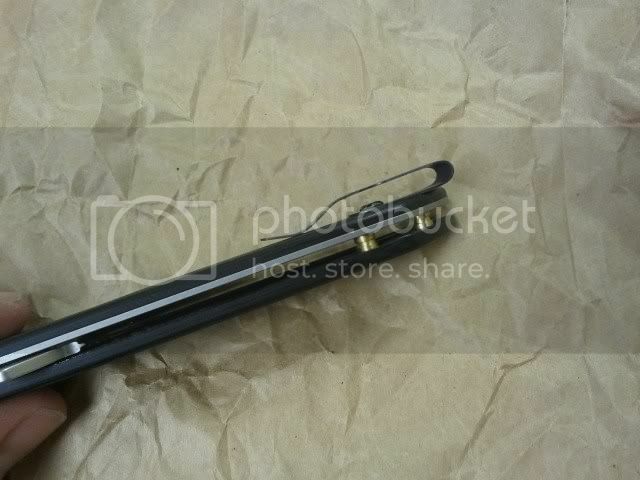 You may also notice the brass back spacers I made for this knife as well as the mod'ed factory clip in the first pic. I have similar pictographic essays written up from when I did those I can post if you would like some other ideas on modifying. Thanx for the kind words, everyone!